Just swtiched to tableau from Powerbi. In powerbi it's possible to edit quries also the dataset edit and add stuff. Now I wanna add index rank column in my dataset but I can't really find anywhere in the software where I can edit the dataset. My dataset is from google sheet. You cannot edit data in Tableau. It is an analysis tool, not a write-back tool. There is a way to ADD that functionality to Tableau, using an Extension, but there are limits to what you can do. You cannot directly edit the underlying query Tableau uses to pull data from a source. If you use Custom SQL (if your root source of data supports it) you can write a query from scratch to do what you want, but the generated SQL that Tableau produces behind the scenes is not directly editable by you. What are you trying to accomplish by adding the "index rank" OUTSIDE of Tableau? Can you not get what you want by writing a calculated field within Tableau once the data is loaded? So you mean that the data must already been cleaned and structured and added all necessary columns before move on to Tableau? My issue is I have connected to my Google Sheet there are 4 sheets of data from Q1,Q2,Q3,Q4 and there not any columns of date or Quarter in the original dataset from Google sheet, the idea is this data would be live so when something changes in the Sheet then it would be updated in the tableau dashboard, so I wanna do it manually by something maybe index rank column and then join them all together so I can from there create a slicer Q1, Q2, Q3 etc... and the graph will interact with each Q1,Q2 etc. What's best way to do it? Any chance you could share a sample of your data set and an example of your end goal? There are 4 data file, which represent for Q1,Q2,Q3,Q4 inside there are same column names for all files but different data numbers which represent for each Quarter. The data files don't have any columns for neither date or quarter, which make it difficult to make a line chart based on quarter. 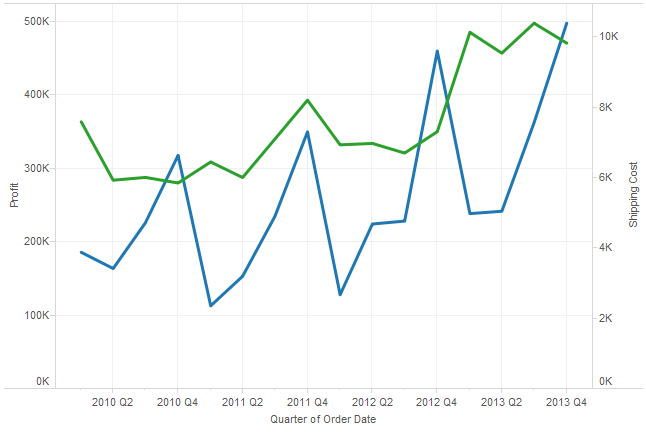 I wanna make dual line chart CTR and Views on Y-axis and Quarter on X-axis. I think you'd really benefit from watching some introductory videos on how Tableau works. If you're on a current version of Tableau Desktop, you should also download and install Tableau Prep. Most of what you want to do to prepare the data can be done in Prep. You can also do it in Tableau Desktop itself, by UNIONing the 4 files. Go here and start at the first set of videos. You really need to understand the basic principles of how Tableau does things, how calculated fields work, how to reshape data and so on. You can't edit the underlying data, but you can create calculated fields to manipulate the data. What is the exact definition of an index rank column ? Do you have any sample data you can attach ? The data files don't have any columns for neither date or quarter, which make it difficult to make a line chart based on quarter. Not really, you're probably going to UNION the sheets anyway, and then Tableau will create a "Sheet Name" field that add the tab name into the data.